Hyper-converged infrastructures (HCI) can bring several design and operational benefits to the table, adding to the long list of reasons behind its popularity. Yet, HCI also introduces new considerations in understanding and measuring technical costs associated with the architecture. These technical costs could be thought of as a usage “tax” or “overhead” on host resources. The amount attributed to this technical cost can vary quite drastically, and depends heavily on the architecture used. For an administrator, it can be a bit challenging to measure and understand. The architecture used by HCI solutions should not be overlooked, as these technical costs can not only influence the performance and consistency of the VMs, but dramatically impact the density of VMs per host, and ultimately the total cost of ownership. With HCI, host resources (CPU, memory, and network) are now responsible for an entirely new set of duties typically provided by a storage array found in a traditional three-tier architecture. These responsibilities not only include handling VM storage I/O from end to end, but due to the distributed nature of HCI, hosts will take part in storage activity of VMs not local to the host, such as replicated writes of a VM, as well as data at rest operations and other services related to storage. These responsibilities consume host resources. The question is, how much? This multi-part series is going to look at the basics of HCI architectures, and how they behave differently with respect to their demands on CPU, memory, and network resources. Operational comparisons are not covered in this series simply to maintain focus on the intent of this series. The term "storage efficiency" is commonly associated with just data deduplication and compression. With hyper-converged infrastructures, this term takes on additional meaning. Storage efficiency in HCI relates to the efficiency of how I/Os are delivered to and from the VM. 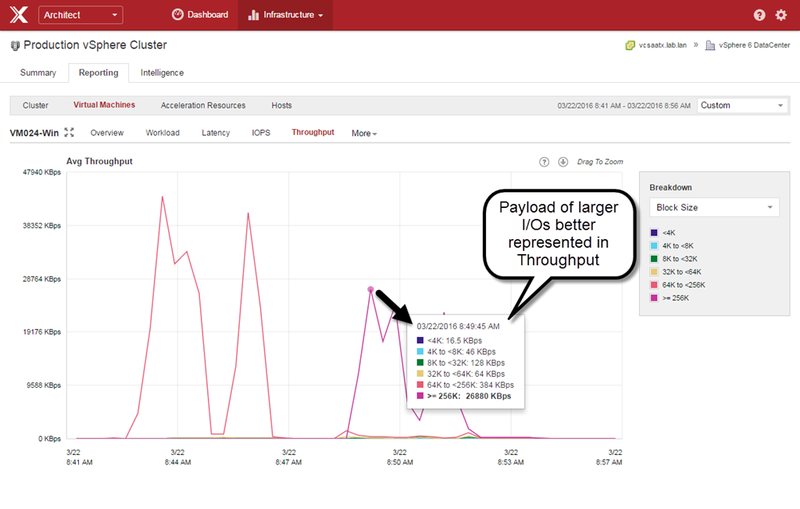 Efficiency of I/O delivery to and from VMs matter not only from performance and consistency as seen by the VM, but how much resource usage is introduced to the hosts in the cluster. The latter is often never considered, yet extremely important. Virtual appliance approach. A VM lives on each host in the cluster, delivering a distributed shared storage plane, processing I/O and the other related activities. Depending on the particular HCI solution, this virtual appliance on each host may also be responsible for a number of other duties. Integrated/in-kernel approach. The distributed shared storage system is a part of the hypervisor, where key aspects of the storage system are part of the kernel. This allows for virtual machine I/O to traverse through the native kernel I/O path for the hosts participating in that I/O activity. HCI solutions that use a VM to process storage I/O on each host reside in a context (user space) that is no different than application VMs running on the host. In other words, the resources allocated to this virtual appliance to perform system level storage duties, contend for the same resources as the VMs that it is trying to serve. 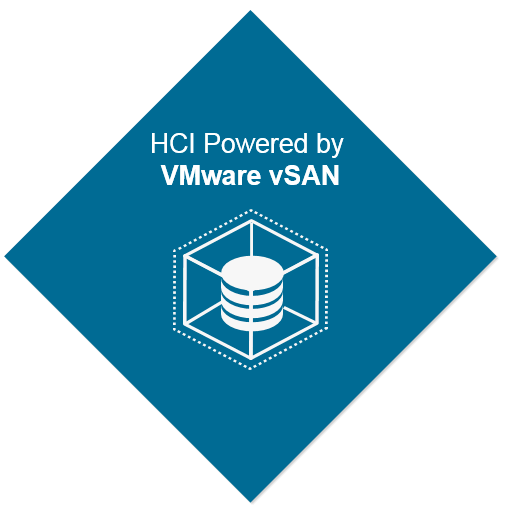 HCI solutions built into the hypervisor maintain end-to-end control and awareness of the I/O. Since an in-kernel, integrated solution allows I/O to traverse through the native kernel I/O path, it uses the least "costly" way to use host resources. HCI solutions built into the kernel minimize the amplification of I/Os and the CPU and memory resources it takes to process those I/Os from end to end. 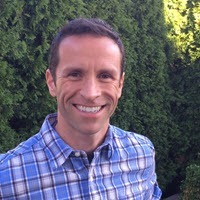 Sometimes virtual appliance based HCI solutions will use devices on hosts configured in the hypervisor for direct pass-through (aka “VMDirectPath”) in an attempt to reduce overhead, but many of the fundamental penalties (especially as they relate to CPU cycles) of I/O amplification through this indirect path and context switching remain. Why are their multiple approaches? Manufacturers may state many reasons why they chose a specific approach, and why their approach is superior. Most the decision comes from technical limitations and go-to-market pressures. An HCI vendor may not have the access, or the ability to provide this functionality natively in the kernel of a hypervisor. A virtual appliance approach is easier to bring to market, and naturally adaptable to different hypervisors since it is little more than a virtual machine to process storage I/O. By way of comparison, those who have full ownership of the hypervisor can integrate this functionality directly into the hypervisor, and when appropriate, build some aspects of it right into the kernel, just as other core functionality is built into the kernel. Resource efficiency, hypervisor feature integration, as well as the contextual awareness and control of I/O types are typically the top reasons why it is beneficial to have a distributed storage mechanism built into the hypervisor. Do both approaches work? Yes. Do both approaches produce the same result in VM behavior and host resource usage? No. Running the same workloads using HCI solutions with these two different architectures may produce very different results on the VMs, and the hosts that serve them. The degree of impact will depend on the technical cost (in resource usage) of the I/O processing, and other data services provided by a given solution. The average number of active VMs per host when running your real workloads. The performance characteristics of the VMs and hosts when running your real workloads while hosts are busy serving other workloads. These measurements above take this topic from an occasionally tiresome academic debate, and demonstrates the differences in real world circumstances. Ironically, faster hardware can increase, not reduce, the differences between these architectural approaches to HCI. This is not unlike what occurs quite often now at the application level, where faster hardware exposes actual bottlenecks in software/application design previously unnoticeable with older, slower hardware. Now that an explanation has been given as to why "storage efficiency" really means so much more than data services like deduplication and compression, the next post in this series will focus on CPU resources in HCI environments, and what to look out for when observing CPU usage behaviors in HCI environments. Does the concept of host resource usage interest you? If so, stay tuned for the book, vSphere 6.5 Host Resources Deep Dive by Frank Denneman and Niels Hagoort. It is surely to be a must-have for those interested in the design and optimization of virtualized environments. You can also follow updates from them at @hostdeepdive on Twitter. One of the many challenges to proper data center design is trying to accommodate for future changes, and do so in a practical way. Growth is often the reason behind change, and while that is inherently a good thing, IT budgets often don’t see that same rate of increase. CFO’s expect economies of scale to make your environment more cost efficient, and so should you. Unfortunately, applications are always demanding more resources. The combination of commodity x86 servers and virtualization provided a flexible way to accommodate growth when it came to compute and memory resources, but addressing storage capacity and storage performance was far more difficult. Hyper-converged architectures helped break down this barrier somewhat, but some solutions lacked flexibility to cope with increasing storage capacity or performance beyond the initial prescribed configurations defined by a vendor. Users need a way to easily increase their HCI storage resources in the middle of a lifecycle without always requesting for yet another capital expenditure. But wait… it doesn’t always have to be that way. 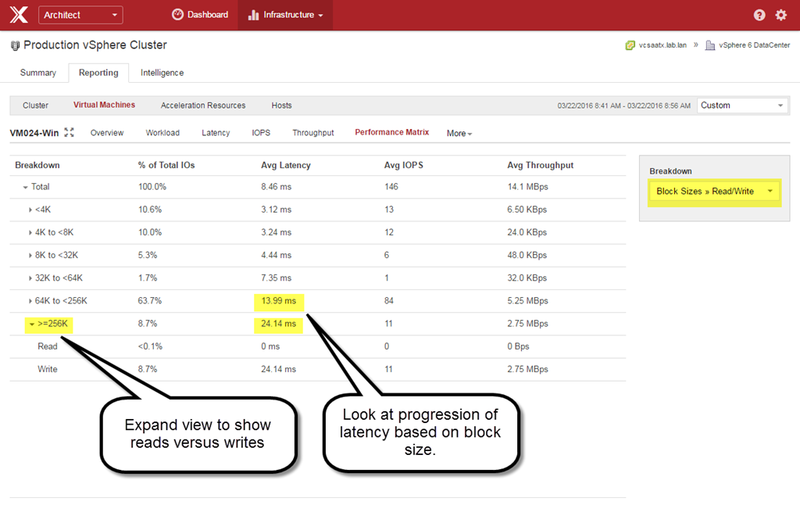 Take a look at my post on Virtual Blocks on Options in scalability with Virtual SAN. See how VSAN allows for a smarter way to approach your evolving resource needs, giving the power of choice in how you scale your environment back to you. Whether you choose to build your own servers using the VMware compatibility guide, go with VSAN Ready Nodes, or select from one of the VxRAIL options available, the principals described in the post remain the same. I hope it sparks a few ideas on how you can apply this flexibility in a strategic way to your own environment. Most Data Center Administrators are accustomed to looking for high CPU utilization rates on VMs, and the hosts in which they reside. This shouldn’t be a big surprise. After all, vCenter, and other monitoring tools have default alarms to alert against high CPU usage statistics. Features like DRS, or products that claim DRS-like functionality factor in CPU related metrics as a part of their ability to redistribute VMs under periods of contention. All of these alerts and activities suggest that high CPU values are bad, and low values are good. But what if conventional wisdom on the consumption of CPU resources is wrong? Infrastructure metrics can certainly be a good leading indicator of a problem. Over the years, high CPU usage alarms have helped correctly identified many rogue processes on VMs ("Hey, who enabled the screen saver via GPO?…"). But a CPU alarm trigger assumes that high CPU usage is always bad. It also implies that the absence of an alarm condition means that there is not an issue. Both assumptions can be incorrect, which may lead to bad decision making in the Data Center. The subtleties of performance metrics can reveal problems somewhere else in the stack – if you know how and where to look. Unfortunately, when metrics are looked at in isolation, the problems remain hidden in plain sight. This post will demonstrate how a few common metrics related to CPU utilization can be misinterpreted. 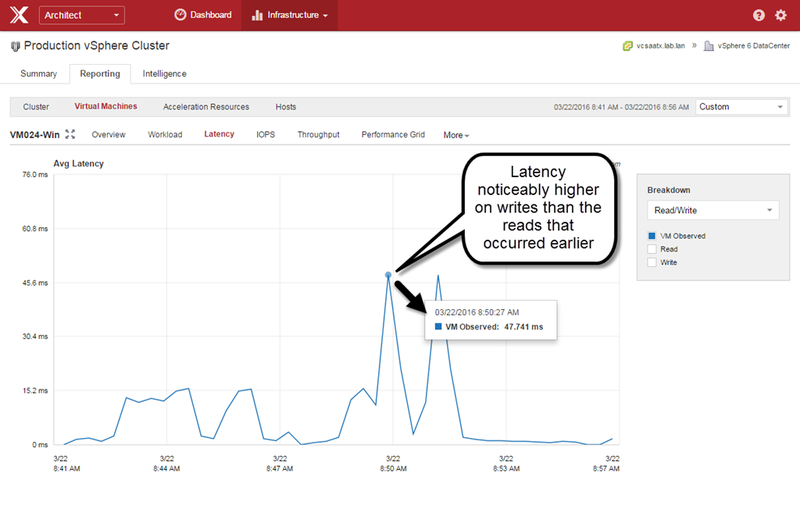 Take a look at the post Observations with the Active Memory metric in vSphere to see how this can happen with other metrics as well. 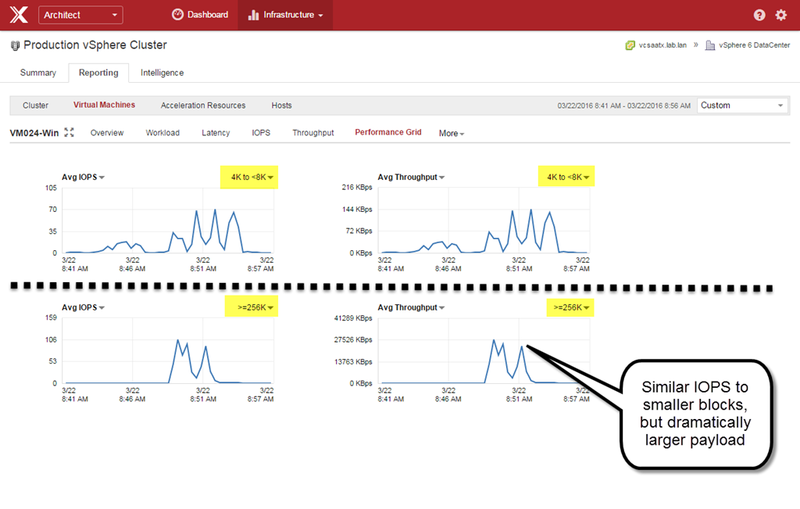 There are a number of CPU related metrics to monitor in the hypervisor, and at least a couple of different ways to look at them (vCenter, and esxtop). For brevity, lets focus on two metrics that readily visible in vCenter; CPU Usage and CPU Ready. This doesn’t dismiss the importance of other CPU related metrics, or the various ways to gather them, but it is a good start to understanding the relationship between metrics. As a quick refresher, CPU Usage as it relates to vCenter has two definitions. From the host, the usage is the percentage of CPU cycles in use against the total CPU cycles available on the host. On the VM, usage shows the percent of CPU resources in use against the total available CPU cycles of the vCPUs visible to the VM. CPU Ready in vCenter measures in summation form, the amount of time that the virtual machine was ready, but could not get scheduled to run on the CPU. The tests here comprise of activities that are scheduled inside each guest, and are repeated 5 times over a 1 hour period. The activities performed are using processes that are only partially multithreaded. This approach is most reflective of real world environments. The "slower" storage depicted in the testing were actually SSDs, while the "faster" storage was by leveraging PernixData FVP and distributed fault tolerant memory (DFTM) as a storage acceleration tier. The absolute numbers are not necessarily important for this testing. The focus is more about comparing values when a variable like storage performance changes. No shares, reservations, or limits were used on the test VMs. The complex demands of real world environments may exhibit a much greater impact than what the testing below reveals. I reference a few actual cases of production workloads later on in the post. Synthetic load generators were not used here because they cannot properly simulate a pattern of activity that is reflective of a real environment. Synthetic load generators are good at stressing resources – not simulating real world workloads, or the time it takes for those workloads to complete their tasks. Looking at CPU utilization can be challenging because not all applications, nor the workloads they generate are the same. Most applications are a complex mix of some processes being multithreaded, while others are not. Some processes initiate storage I/O, while others do not. 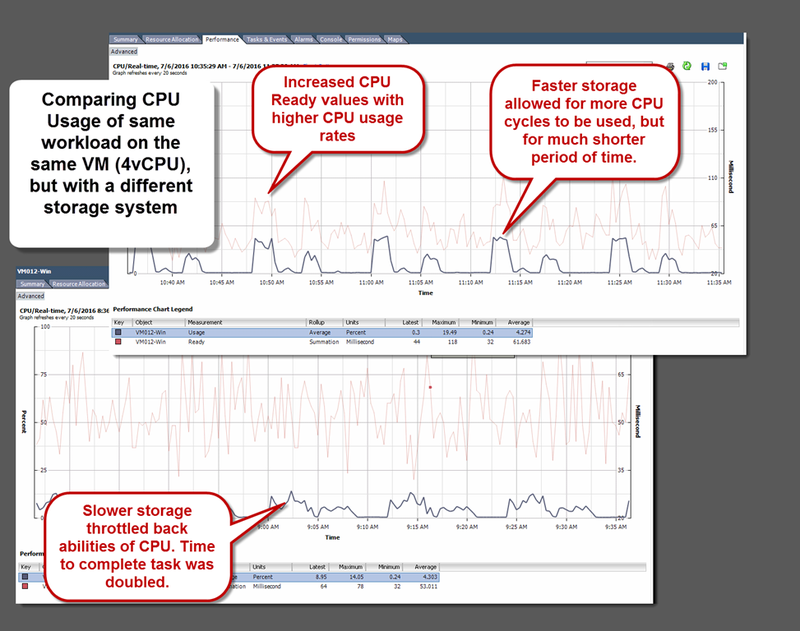 It is for this reason that we will look at CPU Usage and CPU Ready over a task that is repeated on the same sets of VMs, but using storage that performs differently. For all practical purposes, CPU Ready doesn’t become meaningful until a host is running a large number of single vCPU VMs concurrently, or a number of multiple vCPU VMs concurrently. CPU Ready can sometimes be terribly tricky to decipher because it can be influenced in so many ways. Sometimes it may align with CPU utilization, while other times it may not. It may be affected by other resources, or it may not. It really depends on the environmental conditions. I find it a good supporting metric, but definitely not one that should stand on its own merit, without proper context of other metrics. We are measuring it here because it is generally regarded as important, and one that may contribute to load distribution activities. First let’s look at one of the very simplest of comparisons. A single vCPU VM with no other activity occurring on the host, where one test is using slower storage (blue), and the other test it is using faster storage (orange). A task was completed 5 times over the course of one hour. The image below shows that from the host perspective, peak CPU utilization increased by 79% when using the faster storage. CPU Ready demonstrated very little change, which was as expected due to the nature of this test (no other VMs running on the host). When we look at the individual VMs, the results are similar. 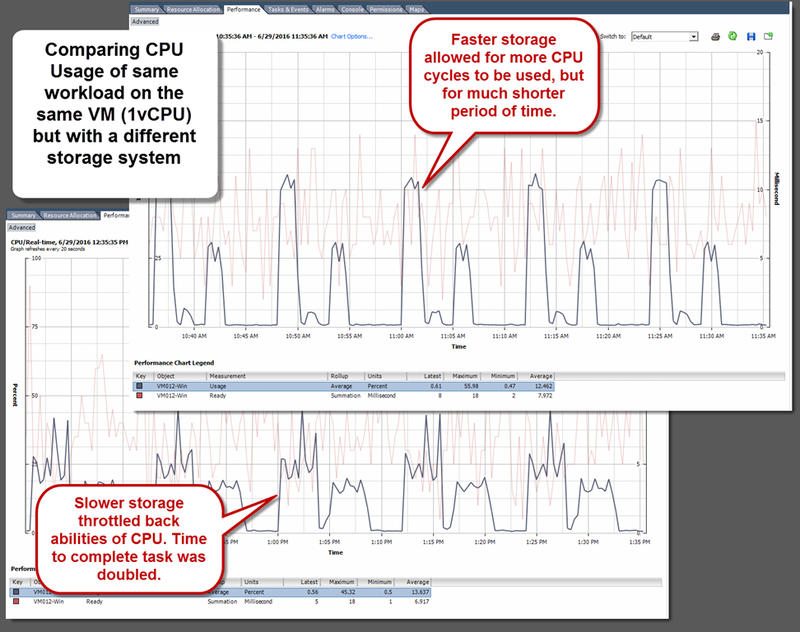 The images below show that CPU usage maximums for the VM increased by 24% when using the faster storage. CPU Ready demonstrated very little change here because there were no other VMs to contend with on that host. The "Storage Latency" column shows the average storage latency the VM was seeing during this time period. You might think that higher latency may not be realistic of today’s storage technologies. The "slower" storage in this case did in fact come from SSD based storage. But remember that Flash of any kind can suffer in performance when committing larger block I/O which is quite common with real workloads. 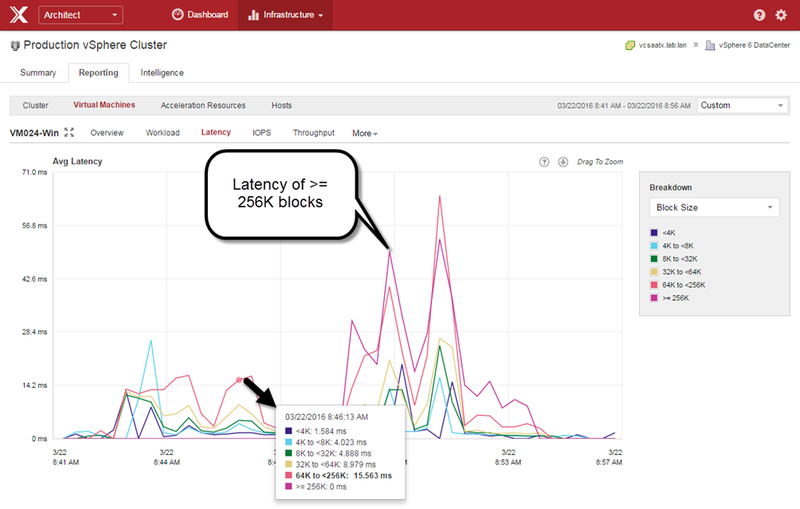 Take a look at "Understanding block sizes in a virtualized environment" for more information. But wait… how long did the task, set to run 5 times over the period of one hour take? Well, the task took just half the time to run with the faster storage. The same amount of cycles were processing the same amount of I/Os, but just for a shorter period of time. This faster completion of a task will free up those CPU cycles for other VMs. This is the primary reason why the averages for CPU Usage and CPU Ready changed very little. Looking at this data in a timeline form in vCenter illustrates it quite clearly. There is a clear distinction of the characteristics of the task on the fast storage. Much more difficult to decipher on the run with slower storage. Now let’s let the same workload run on VMs with assigned multiple (4) vCPUs, along with other multi-vCPU VMs running in the background. This is to simulate a bit of "chatter" or activity that one might experience in a production environment. As we can see from the images below, on the host level, both CPU usage and CPU ready values increased as storage performance increased. CPU usage maximums increased by 39% on the host. CPU Ready maximums increased by 34% on the host, which was a noticeable difference than testing without any other systems running. When we look at the individual VMs, the results are similar. The images below show that CPU usage maximums increased by 39% with the faster storage. CPU Ready maximums increased by 51% while running on the faster storage. Considering the typical VM to host consolidation ratio, the effects can be profound. Now let’s take a look at the timeline in vCenter to get an appreciation of how those CPU cycles were used. On the image below, you can see that like the single vCPU VM testing, the VM running on faster storage allowed for much higher CPU usage than when running on slower storage, but that it was for a much shorter period of time (about half). You will notice that in this test, the CPU Ready measurements generally increases as the CPU usage increased. This all brings me back to what I witnessed years ago while administering a vSphere environment consisting of extremely CPU and storage I/O intensive workloads. Dozens of resource intensive VMs built for the purpose of compiling code. These were systems using that could multithread to near perfection – assuming storage performance was sufficient. Now let’s look at what CPU utilization rates looked like on that same VM, running the same code compiling job where the storage environment wasn’t able to satisfy reads and writes fast enough. The same job took 46% longer to complete, all because the available CPU cycles couldn’t be used. Still not a believer? Take a look at a presentation at the OpenStack summit by Charter Communications in April 2016, where they demonstrate exactly the effect I describe. Their Cassandra cluster deployed with VMware Integrated OpenStack, and the effects of CPU utilization when providing lower latency, higher performing storage. (key information beginning at 17:10). Their more freely breathing storage allowed CPU cycles related to storage I/O to be committed more quickly, thereby finishing the tasks much more quickly. High CPU usage was a desired result of theirs. You might be thinking to yourself, "Won’t I have more CPU contention with faster storage?" Well, yes and no. Faster storage will give power back to the Administrator to control the usage of resources as needed, and deliver the SLAs required. And moving the point of contention to the CPU allows for what it does best; time slicing processes to complete the tasks as quickly as possible. The rate at which telemetry data is sampled is a factor that can dramatically change your impression of the behavior of these resources used in the Data Center. It’s a big topic, and one that will be touched on in an upcoming post, but there is one thing to note here. When leveraging faster, lower latency storage, there are many times where CPU utilization and CPU Ready will stay the same. Why? In a real workload that involve CPU cycles executing to commit storage I/O, a workflow can may consist of a given amount of those I/Os, regardless of how long it takes. 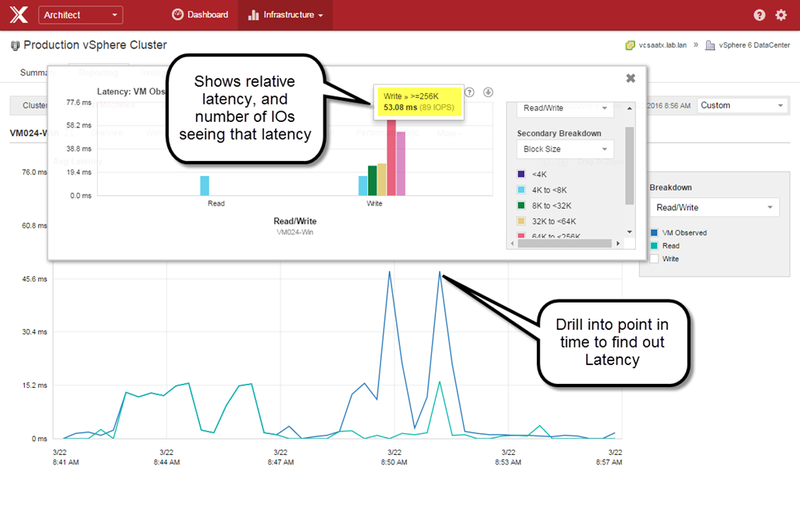 If that process took 18 seconds on slow storage, but 5 seconds on faster storage, the 20 second sampling rate within vCenter may render it in the same way. One often has to employ other tools to see these figures at a higher sampling rate. Tools such as vscsiStats and esxtop are good examples of this. The testing, and examples above should make it easy to imagine a scenario in which a storage system is upgraded, and CPU related alarms are tripped more frequently, even though the processes that support a workflow have completed much more quickly. So with that, it’s good to keep the following in mind. Slow storage will suppress CPU utilization rates – giving you the impression that from a host, or VM perspective, everything is fine. Conversely, Fast storage will allow those CPU cycles related to storage I/O to execute, thereby increasing utilization rates – albeit for a shorter period of time. High CPU statistics are not necessarily a bad thing. Higher CPU utilization rates may not be a leading indicator of an issue. They are often be a trailing indicator of well-designed processes, or free breathing storage. Again, high CPU can be a good thing!!! Application behavior, and the results are what counts. If a batch job in SQL takes 30 minutes, defining success should be around the desired time of that batch job. Infrastructure related metrics should help you diagnose issues and assist with achieving a desired result, but not be the one and only KPI. 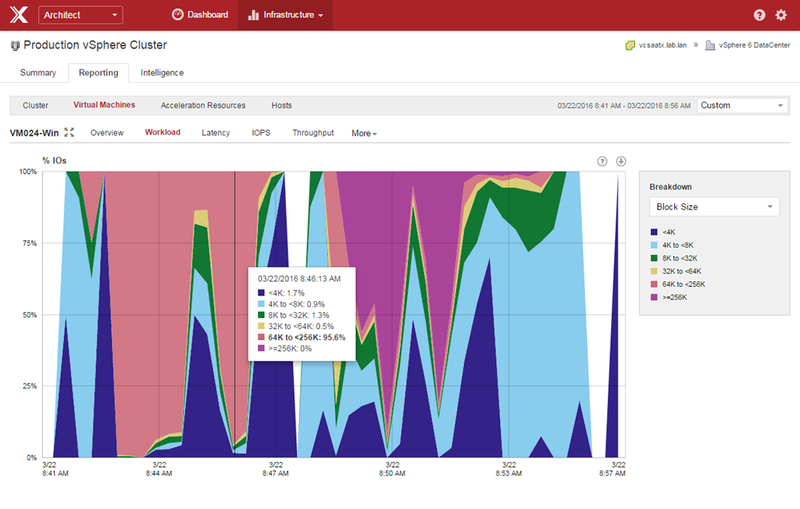 Storage performance will generally impact every VM and host accessing the cluster. Whereas host based resource contention will only impact other VMs living on that same host. There is no mistaking the value of data visualization combined with analytics. Data visualization can help make sense of the abstract or information not easily conveyed by numbers. Data analytics excels at taking discrete data points that make no sense on their own, into findings that have context, and relevance. The two together can present findings in a meaningful, insightful, and easy to understand way. But what are your analytics really telling you? The problem for modern IT is that there can be an overabundance of data, with little regard to the quality of data gathered, how it relates to each other, and how to make it meaningful. All too often, this "more is better" approach obfuscates the important to such a degree that it provides less value, not more. it’s easy to collect data. The difficulty is to do something meaningful with the right data. Many tools collect metrics in an order not by which is most important, but what can be easily provided. Modern storage solutions have increased their sophistication in their analytics offerings for storage. In principle this can be a good thing, as storage capacity and performance is such a common problem with today’s environments. Storage vendors have joined the "we do that too" race of analytics features. However, feature list checkboxes can easily mask the reality – that the quality of insight is not what you might think it is. Creative license gets a little, well, creative. Some storage solutions showcase their storage I/O analytics as a complete solution for understanding storage usage and performance of an environment. Advertising an extraordinary amount of data points collected, and sophisticated methods for collection of that data that is impressive by anyone’s standards. But these metrics are often taken at face value. Tough questions need to be asked before important decisions are made off of them. Is the right data being measured? Is the data being measure from the right location? Is the data being measured in the right way? And is the information conveyed of real value? Accurate analytics requires that the sources of data are of the right quality and completeness. No amount of shiny presentation can override the result of using the wrong data, or using it in the wrong way. The right data has a supporting influence on the questions that you are trying to answer. Why did my application slow down after 1:18pm? 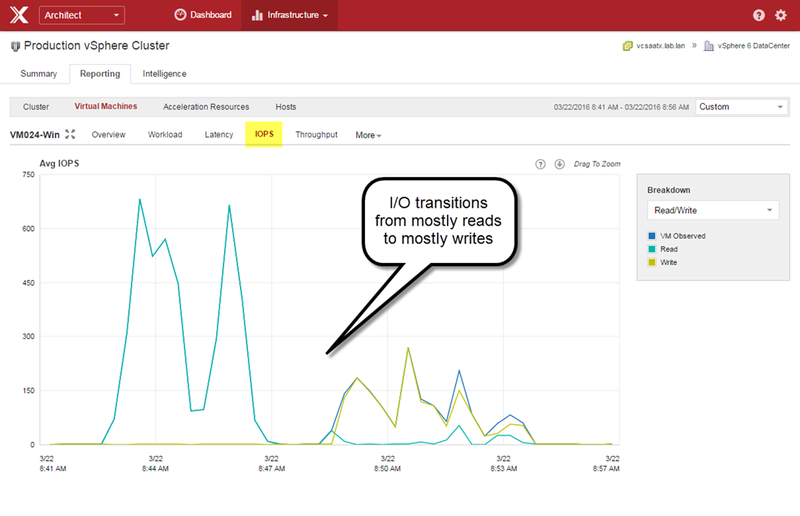 How did a recent application modification impact other workloads? In Infrastructure performance, I’ve demonstrated how block sizes have historically been ignored when it came to storage design, because they could not have been easily seen or measured. Having metrics around fan speed of a storage array might be helpful for evaluating your cooling system in your Data Center, but does little to help you understand your workloads. The right data must also be collected at a rate that accurately reflects the real behavior. If your analytics offerings sample data once every 5 or 10 minutes, how can it ever show spikes of contention in resources that impact what your systems experience? The short answer is, they can’t. Measuring the data at the right location is critical to accurately interpreting the conditions of your VMs, and the infrastructure in which they live. We perceive much more than we see. This is demonstrated most often with a playful optical illusion, but can be a serious problem with understanding your environment. The data gathered is often incomplete, and how you perceived it by virtue of assuming it was all the data you need all lead to the wrong conclusion. Let’s consider a common scenario where the analytics of a storage system shows great performance of a storage array, yet the VM may be performing poorly. This is the result of measuring from the wrong location. The array may have showed the latency of the components inside the device, but cannot account for latency introduced throughout the storage stack. The array metric might have been technically accurate for what it was seeing, but it was not providing you the correct, and complete metric. Since storage I/O always originate on the VMs and the infrastructure in which they live, it simply does not make sense to measure them from a supporting component like a storage array. Measuring data inside the VM can be equally as challenging. Operating Systems’ method of data collection assume they are the sole proprietor of resources, and may not always accurately account for that fact that it is time slicing CPU clock cycles with other VMs. While the VM is the end "consumer" of resource, it also does not understand it is virtualized, and cannot see the influence of performance bottlenecks throughout the virtualization layer, or any of the physical components in the stack that support it. VM metrics pulled from inside the guest OS may measure thing in different ways depending on Operating System. Consider the differences in how disk latency in Windows "Perfmon" is measured versus Linux "top." This is the problem with data collector based solutions that aggregate metrics from difference sources. A lot of data collected, but none of it means the same thing. This disparate data leaves users attempting to reconcile what these metrics mean, and how they impact each other. Even worse when supposedly similar metrics from two different sources show different data. This can occur with storage array solutions that hook into vCenter to augment the array based statistics. Which one is to be believed? One over the other, or neither? Statistics pulled solely from the hypervisor kernel avoids this nonsense. It provides a consistent method for gathering meaningful data about your VMs and the infrastructure as a whole. The hypervisor kernel is also capable of measuring this data in such a way that it accounts for all elements of the virtualization stack. However, determining the location for collection is not the end-game. We must also consider how it is analyzed. Metrics are just numbers. More is needed than numbers to provide a holistic understanding for an environment. Data collected that stands on its own is important, but how it contributes to the broader understanding of the environment is critical. One needs to be able to get a broad overview of an environment to drill down and identify a root cause of an issue, or be able to start out at the level of an underperforming VM and see how or why it may be impacted by others. Many attempt to distill down this large collection of metrics to just a few that might help provide insight into performance, or potential issues. 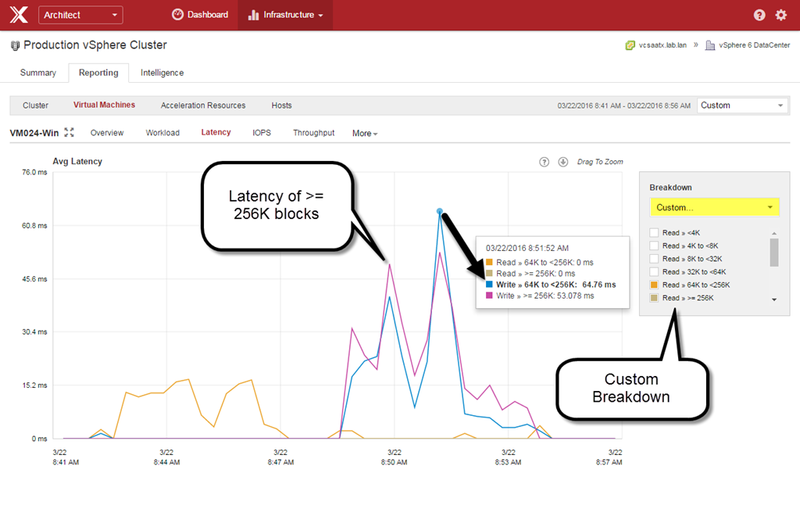 Examples of these individual metrics might include CPU utilization, Queue depths, storage latency, or storage IOPS. However, it is quite common to misinterpret these metrics when looked at in isolation. Holistic understanding provides its greatest value when attempting to determine the impact of one workload over a group of other workloads. A VM’s transition to a new type of storage I/O pattern can often result in lower CPU activity; the exact opposite of what most would look for. The weight of impact between metrics will also vary. Think about a VM consuming large amounts of CPU. This will generally only impact other VMs on that host. In contrast, a storage based noisy neighbor can impact all VMs running on that storage system, not just the other VMs that live on that host. Whether your systems are physical, virtualized, or live in the cloud, analytics exist to help answer questions, and solve problems. But analytics are far more than raw numbers. The value comes from properly digesting and correlating numbers into a story providing real intelligence. All of this is contingent on using the right data in the first place. Keep this in mind as you think about ways that you currently look at your environment. 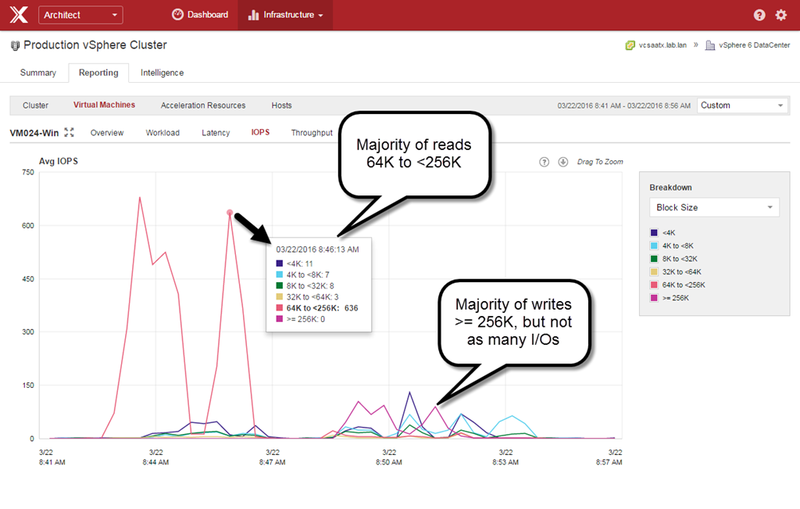 Author vmPetePosted on June 23, 2016 Categories Applications, Architecture/planning, SAN, virtualization, VMwareTags analytics1 Comment on What does your infrastructure analytics really tell you?